Looked great on! Perfect for layering. Zip up this leather bomber jacket to stay warm and in style. Genuine leather with natural grain features a distressed finish for the worn-in look with strength and durability to remain a part of your wardrobe. The slim, European cut offers a flattering fit, with a fully lined construction for a smooth look. Dimensions 24.0 In. X 6.0 In. X 6.0 In. I was a bit weary when I saw the cost of the jacket as most are much more expensive. Upon receiving the jacket, I was impressed by its weight and sturdiness. I could immediately tell this jacket would last me many years. I would recommend getting some leather conditioner on it immediately as mine arrived a bit stiff but, like all real leather products, it will take a bit of time to break it in. Overall, I am very happy with this purchase! 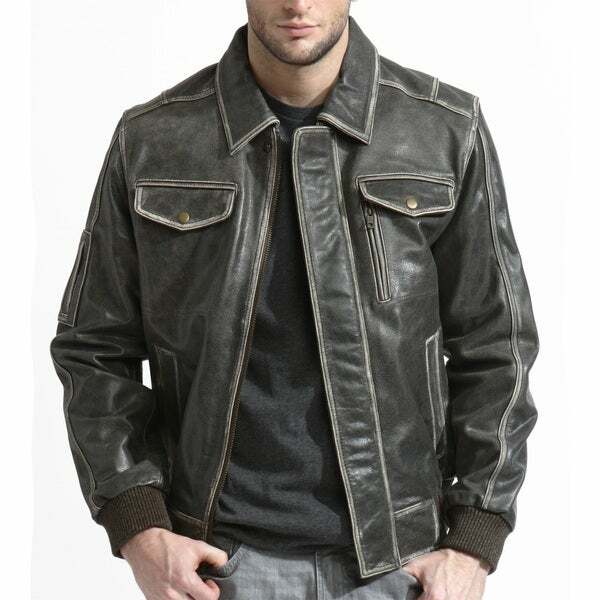 Nice jacket style but the color is too grayish, makes the leather looks dull and low quality appearance.